A typical monthly charge for an HD box from the cable company is about $10. MrConsumer has been renting one for 10 years at this point, and if you do the math, that's a whopping $1200. This unit retails for $129, so the savings can be enormous. On sale, it can be $69.99 or $79.99. MrConsumer paid just $49.99 at TigerDirect (minus an additional $15 TigerDirect discount courtesy of AMEX). Get on TigerDirect's email list to receive periodic sale notices. So will you save a full $10 a month? Some cable companies get you coming and going. Comcast, for example, has fees like an "HD fee" just for the privilege of having an HD signal. And they also have an "extra outlet" fee. Be sure to find out what fees, if any, your cable provider might impose. 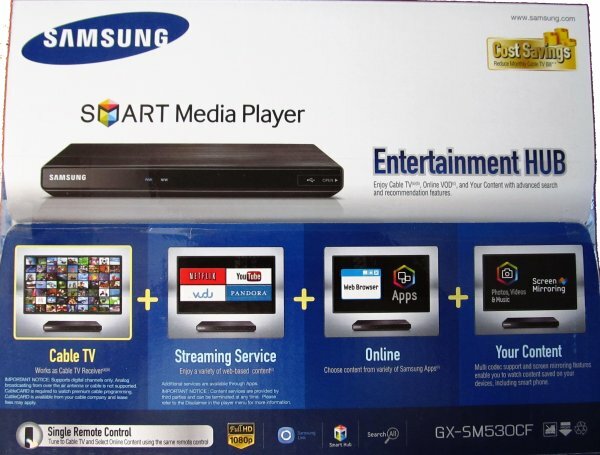 Samsung is marketing this product as a multi-function box that, in essence, will make your dumb HDTV smart. It has a built-in browser to allow you to stream the Internet wirelessly from your router. It has built-in apps like Netflix, so you don't have to buy a separate Roku box or Chromecast. And if you have a smartphone or tablet that supports screen mirroring, you can magically have whatever is on the screen of those devices on your HDTV screen. But the biggest thing is that this device is also a cable box with a slot in the back for a cablecard. 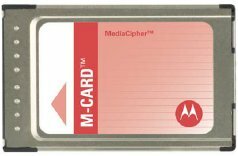 A cablecard is a security device, a bit larger than a credit card, that lets the cable company control your access to its programming. You will have to get a cablecard from your cable company. Some cable companies will give you one free cablecard (Comcast) and others will charge a minimal monthly rental fee of $1.50 or $2.00. While it is possible to buy your own cablecard online, your cable company may be unwilling or unable to activate it. Once you buy the box, and obtain a cablecard, you have to set it up. To do that, follow the instructions and screen prompts. It is a relatively easy and logical process. Then you have to deal with your cable company to activate the cablecard you have obtained from them and inserted into the back of the box. This may or may not be easy. You may need to provide all kinds of ID numbers that the cablecard generates, but does not have printed on the card itself. Samsung unfortunately hides all this information from you. It is in Settings-->Broadcasting-->Cablecard Info. And, some cable companies that are not yet all-digital, may require you to also get from them and install a tuning adapter. You now should be good to go. There are some limitations that you need to know about, however. This is a one-way box. That means you cannot access on-demand programming. So, if on-demand is important to you, or you don't want to give up your DVR to record programs, keep your primary box that you currently rent. Use this one on a secondary TV. The box gets very hot, and in our view has inadequate ventilation holes. Oddly, it seems to be hotter when turned off than when in operation. That could shorten the life of the box. We also noticed that some channels won't tune in a picture immediately. You may have to go back to it a second or third time. While the idea of having the Internet accessible on your television might seem exciting, you haven't lived until you try to operate the onscreen pointer/mouse using just a few remote control buttons. As for typing in an Internet address, you have to use the left, right, up and down arrows to maneuver over an onscreen keyboard. It is very tedious. If you have a compatible tablet with screen mirroring, then the Internet feature will be much easier to use. Consumers who have purchased this unit and written reviews give it an average of 3.5 stars for various reasons. Don't expect any great technical support from Samsung either, some say. We think Samsung has made a huge mistake by marketing this unit as a smart media player. They need to let the world know that now you can buy a cable box and stop paying monthly rental fees to your cable company. If they did that, we have no doubt that sales of this little-known unit would soar. Certainly can say that they have thrown in the Internet, Netflix and more as a bonus. Who knows how long the Samsung box will last. But, every month it does, could save you close to $10.